The statistic shows GDP in India from 2012 to 2018, with projections up until 2022. In 2018, GDP in India was at around 2.69 trillion US dollars. See figures on India's economic growth here, and the Russian GDP for comparison. Of all the factors and empirical data that give an insight into the shape of a national economy, there aren’t as many indicators more telling than GDP. 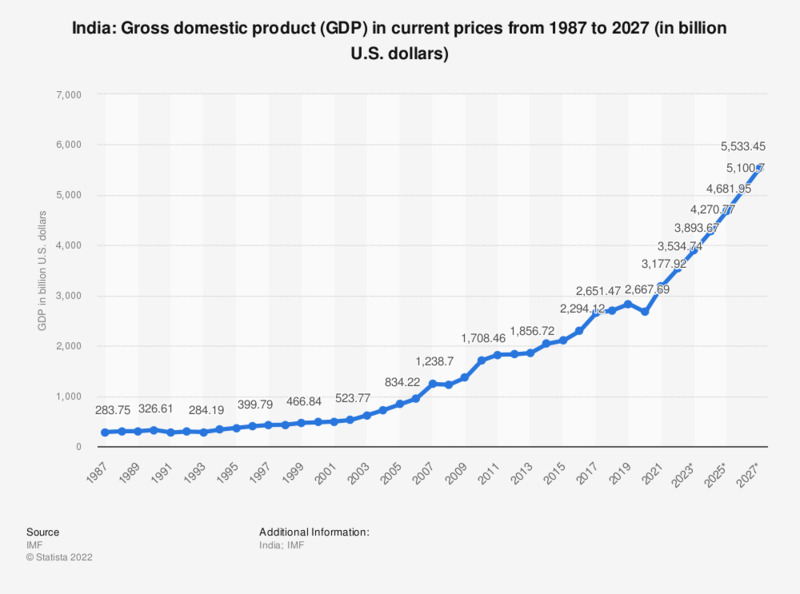 GDP is the total market value of all final goods and services that have been produced within a country in a given period of time, usually a year. Real GDP figures serve as an even more reliable tool in estimating in which direction a country’s economy may be heading, as they are adjusted for inflation and reflect real price developments. The decision of the newly independent Indian government to adopt a mixed economy, adopting both elements of both capitalist and socialist systems, resulted in huge inefficiencies borne out of the culture of interventionism that was a direct result of the lacklustre implementation of policy and failings within the system itself. The desire to move towards a Soviet style mass planning system failed to gain much momentum in the Indian case due to a number of hindrances, an unskilled workforce being one of many. When the government of the early 90’s saw the creation of small scale industry in large numbers due to the removal of price controls, the economy started to bounce back, but with the collapse of the Soviet Union - India’s main trading partner - the hampering effects of socialist policy on the economy were exposed and it underwent a large scale liberalization. By the turn of the 21st century, India was rapidly progressing towards a free-market economy. India’s development has continued and it now belongs to the BRIC group of fast developing economic powers.